Subject: e-APAR Schedule for 2017-18 APARs. 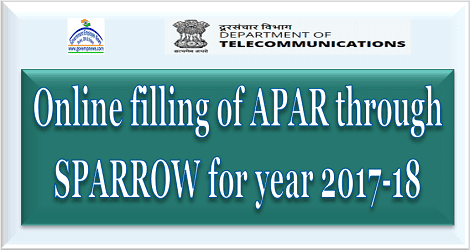 The undersigned is directed to refer to even number OM dated 28.03.2018 regarding of online filling of APAR through SPARROW for year 2017-18. 2. In this regard. it is conveyed that the revised date by which "Submission of self- Appraisal to the reporting officer by officer to be reported upon" to be completed is 30th April 2018. 3. It is noted that rest of the time schedule for Online APAR process remains the same. All the officers of the ITS cadre are requested to adhere to the above instructions scrupulously. 4. This is issued with the approval of Competent Authority. 2. Director (IT) DoT HQ : For kind information please. 3. All PAR/Altcrnate PAR Custodians : For creation of workflow as per the schedule.